Like most vertical markets, today’s banks and financial institutions are dealing with the data deluge brought on by digital transformation. As customers’ demands for instant information access and a frictionless digital experience create new challenges, companies are being forced to adopt business strategies and technologies that enable greater agility, speed, access, and organization to stay ahead. 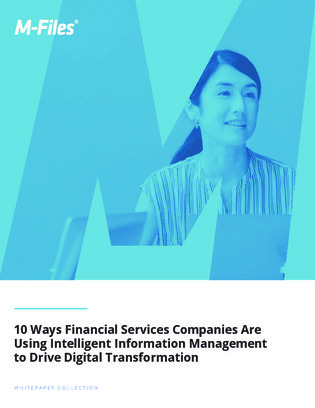 Download this white paper to learn how intelligent information management (IIM) can help banks and financial institutions maintain a competitive edge, and uncover 10 ways in which IIM is being used to drive digital transformation.